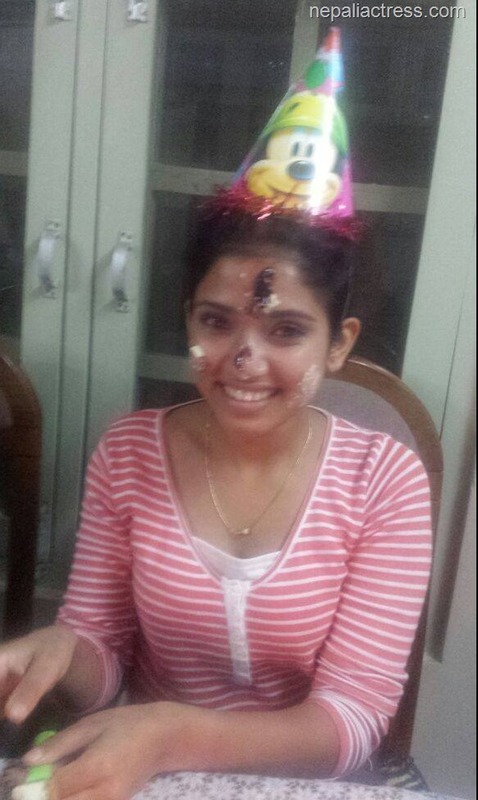 Like every October 31, Surabhi Jain celebrated her birthday on this Friday. She celebrated the special day with her family at her home in Teku and shared the following photo of her birthday. On Friday, Surabhi has turned 25 years old. Surabhi Jain Dashain gift – a new relationship ? Actress Surabhi Jain has announced that she is in a relationship on the Dashain day. Surabhi hasn’t told anything about the identity of the lucky guy. Last year, in Dashain she had lost her wallet. It seems, this year’s festival has fared her better in finding a soul mate. Surabhai Jain taking a break from Nepali film industry? Last updated on January 4th, 2015 at 11:14 pmActress Surabhi Jain debuted in ‘Samaya’ last year. The movie by actress Mausami Malla didn’t do well in theaters. After that Surabhi has done ‘Nagbeli’ directed by choreographer Gobind Rai. Apparently, somebody called her a flop heroine, and she has responded in a Facebook post. Like everybody else, actress Surabhi Jain also visits her elders to take Tika and best wishes. Being a biggest festival and once in a year celebration she enjoys it as much as she can. Surabhi can’t play cards but she enjoys playing in swings. She basically enjoys the festival with her family members.